The Captain is a big believer in having the right tool for the job. I'm a big believer in tools that can be used for multiple jobs. In the course of our gardening adventure, we happened upon something that pleases us both. The Claw is a good manual tool for throwing out your back tilling a small garden. What I needed was something that would help me lightly turn the earth of a large flower bed, while adding sand and topsoil. 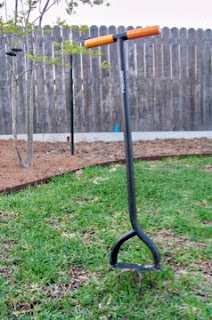 The Captain found a different brand of garden claw, simply dubbed a "tiller", that has a step above the claw. This greatly reduces the potential for back strain because you can use leg power instead of arm power to leverage the spikes into the earth. In addition, it can serve as a lawn aerator. To have our lawn care specialists perform this service would cost us $70. I can do it myself in a morning, with my $25 multi-purpose tool. Plus the brand is Fiskars. Which anyone who sews or does crafty projects knows that Fiskars are the best scissors. I am deeply satisfied. The Captain scores double points for this purchase because it is the Right Tool for Two Jobs.